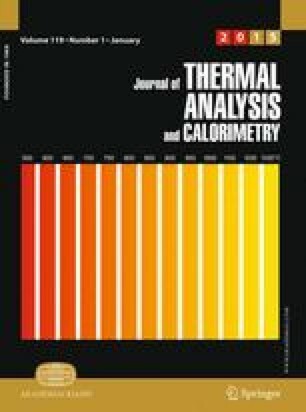 The thermal behavior of Tunisian phosphorite was investigated with X-ray powder diffraction (XRD), Fourier transform infrared (FT-IR), and Raman spectroscopies and DTA-TG measurements. The XRD patterns showed that the chief mineral constituents of calcined samples are calcium oxide and fluorapatite, while those in the raw phosphorite are calcite, dolomite, fluorapatite, and carbonate-fluorapatite. Physicochemical transformations result in the oxidation of organic matter, disappearance of calcite and dolomite crystalline phases, and partial dissociation of structural carbonates. The FT-IR and Raman spectra showed modifications of some bands; a decrease in the intensity of the v2 and v3 vibrations of carbonate groups and the appearance of new bands at 520 and 926 cm−1 after calcination of phosphorites at 800 °C. These bands were assigned to isomorphous substitutions of PO4 3− in apatite by SiO4 4−. Heat treatment alters the qualitative composition of the mineral as a result; the solubility of apatite in dilute citric acid was decreased. We thank Nabil Fattah Professor at Research center of Metlaoui in Company of phosphates of Gafsa for providing the phosphorites samples. This work is supported by the Ministry of Higher Education, Scientific Research and Information and Communication Technologies of Tunisia.